Most drivers who engage in distracted driving are confident about their ability to pay attention to driving while typing a text message, reading an email, or dialing their phone but the statistics strongly disagree. The National Highway Transportation Safety Administration (NHTSA) reports that 3,450 people were killed and 391,000 were injured in distracted driving crashes in a single year. In some places, distracted driving is coming close to overtaking drunk driving in causing traffic fatalities. With all the attention placed on preventing distracted driving, it is always frustrating when we learn another careless driver has caused serious suffering for one of our clients. At Warren & Kallianos, PLLC, our dedicated Charlotte auto accident lawyers fight aggressively to hold distracted drivers accountable and demand maximum compensation for those they hurt. You never pay attorney fees until we recover compensation for you. Schedule a free consultation to discuss your case. Although there are many activities that are clearly distracting while driving, there are others that you may not suspect as being dangerous. For example, you may know it’s dangerous to drive with your pet on your lap, but you may not realize that reaching over to pet your animal in the passenger seat is also a distraction. Visual distractions are anything that requires you to look away from the road. Manual distractions are anything that requires you to take a hand off the steering wheel. Cognitive distractions are anything that causes you to lose focus on the task of driving. Although our distracted driving laws focus on cell phone use, motorists should avoid any activities that may take their focus off the road. The Federal Motor Carrier Safety Administration (FMCSA) has established rules that prohibit commercial truck drivers from using hand-held mobile devices to read or write text messages or dial the phone while they are driving. 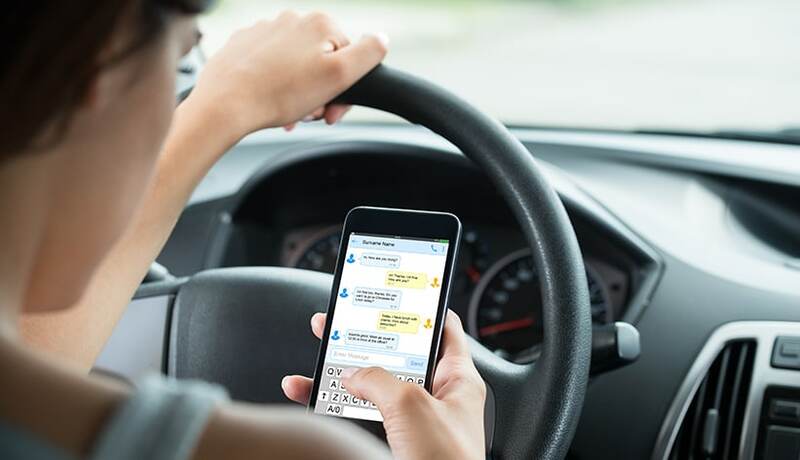 While we tend to associate distracted driving with texting behind the wheel, the rules apply to any activity that distracts the drivers’ attention, eyes, and hands away from the task of driving. Linking a truck accident to distracted driving requires diligent investigation. At Warren & Kallianos, we access the driver’s cellphone records, we talk to eye witnesses at the crash scene, and we work with truck accident reconstruction experts to get at the cause of the crash and hold the truck driver, the trucking company, and any other responsible parties liable for your injuries. Motorcycle riders have no protection from the perils of getting into a crash with other motor vehicles. Even if the rider is wearing a helmet and other protection, getting involved in a car accident can cause serious injuries to the motorcyclist while the driver of the vehicle may suffer much more minimal injuries. While any collision between another motor vehicle and a motorcycle can have dire consequences, distracted driving crashes seem to be the most difficult to comprehend. Distracted driving is completely preventable and when it causes a crash the injured motorcyclist may be entitled to recover compensation for their damages. At Warren & Kallianos, we are here to help you with your distracted driving motorcycle accident claim throughout North Carolina. In some crashes, it is obvious that the other driver was talking, texting, or otherwise driving while distracted. However, it may not always be immediately apparent that distracted driving was to blame. The true cause of the crash should reveal itself during an investigation. The stark reality is that those who refuse to heed the warnings about distracted driving pose a danger to everyone else on the road. Each piece of evidence we collect adds to the strength of your claim. We will use this evidence, along with detailed records documenting the extent of your injuries and other losses, to demand full and fair compensation from the at-fault party. If you or a loved one has been seriously hurt in a distracted driving accident in Charlotte, Mecklenburg County, or anywhere in North Carolina, contact our dedicated legal team today. At Warren & Kallianos, our skilled distracted driving accident attorneys are committed to fighting for maximum compensation for those who have been unjustly hurt. Call 704-275-5593 or fill out our contact form to schedule a free consultation with our attorneys today. We do not charge anything to get started on your claim, and we do not collect attorney fees until we secure compensation for you.